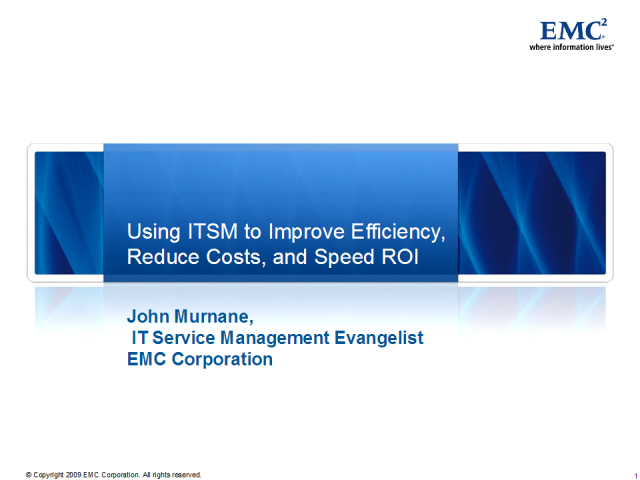 Can ITSM realize efficiency, reduce costs and speed ROI even in a recession – Yes it can! With economic uncertainty prevailing, enterprise IT executives today are tasked with maintaining -- and even increasing services -- with fewer budget dollars. Add to that the complexity resource-optimizing technologies such as virtualization introduce into an environment and IT managers today are more challenged than ever. Attend this session to learn how you can leverage market-leading discovery & dependency mapping capabilities in your organization to manage your IT infrastructure, and more efficiently deliver IT services that increase customer satisfaction, reduce expense and demonstrate business alignment by maximizing ROI.